Roger Payne, Olympic Moving & Storage III, Lakewood, Wash., earned Wheaton’s Permanent Fleet Driver of the Month award. Roger has more than 37 years of experience as a professional household goods driver. This is his first Driver of the Month award. 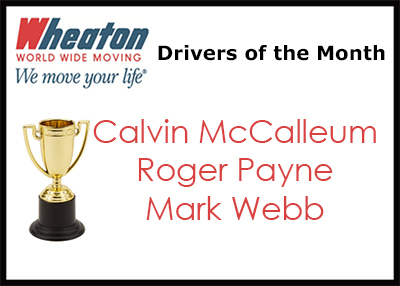 Mark Webb, A+ Moving and Storage, Fayetteville, N.C., earned Wheaton’s Intermittent Fleet Driver of the Month award. Mark has more than 32 years of experience as a professional mover. This is his first Driver of the Month.